Boil the quartered Tomatoes, slitted Green Chillies and chopped Garlic pods with 4 cups of water in a Vessel. Add Turmeric Powder, Cumin seeds powder, Pepper powder, Coriander powder, Jaggery, Salt and Tamarind juice into the vessel and simmer for 15 minutes. Heat Oil in a small frying pan and add the Mustard Seeds. When the Mustard Seeds start to splutter, add the Curry leaves, broken Dry Red Chillies, Asafoetida powder. Fry this for a minute. Pour the contents of the frying pan into the Rasam Vessel. 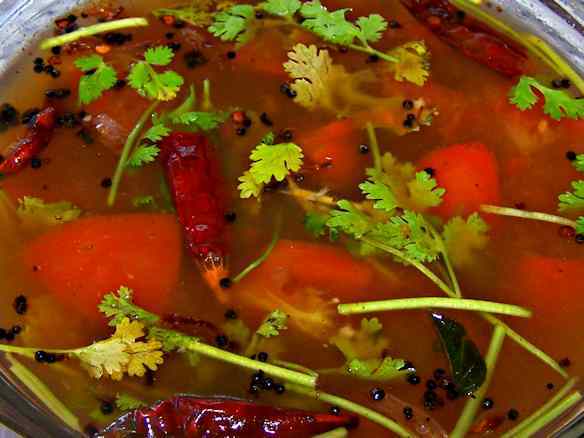 Garnish Tomato Rasam using chopped Coriander Leaves. Tomato Rasam is now ready to serve with rice.